Come on in and stay awhile! Your first chance to welcome and impress guests with your interior decorating chops is in the entryway. Whether it’s a cozy corner where you hang your coat and toss your keys or a grand entrance with sweeping interior views and vaulted ceilings, the right foyer lighting and entryway decor sets the tone for the rest of your home. Use these foyer decorating suggestions to make the most of your space and convey your design sense the second a guest walks in your home. Begin your entryway and foyer design with lighting. Creating a warm welcome in smaller entryways can be beautifully achieved with a central flush ceiling light or semi-flushmount fixture, and coordinating wall sconces flanking the doorway. You want to have just the right amount of light decoration to greet your guests, but not too much. If you have a large foyer in which to work, however, the space pretty much begs for a chandelier hanging overhead. Foyer pendants or entryway chandeliers are often taller and narrower than the traditional chandeliers you might find gracing the dining room, and are designed to fit well within cathedral ceilings and open staircases. You'll find many of the designs hang from a large canopy and present themselves as a statement piece in the room. When combined with sconces next to the front door, you'll create a well-rounded and well-lit entry. 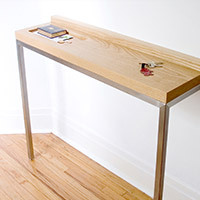 Any size entry benefits from well-designed accent tables too -- a table to catch keys, purses and other essentials you wouldn’t want to leave home without. And for guests, a table placed near the front door makes for a great spot for them to place their keys and any essentials they don't want to carry around the house. Although the tables featured in this assortment have a slim profile, you'll find they offer a decorative and helpful presence, and will pair nicely with other furnishings in the space. And floor coverings are not just for wiping your feet; in addition to serving a functional purpose, entryway & foyer rugs can soften the transition between outdoors and in. 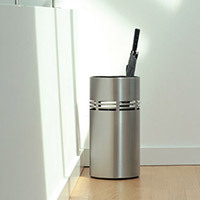 Finally, for those rainy days, you'll love keeping an umbrella stand next to the front door to remind you to grab an umbrella on the way out. 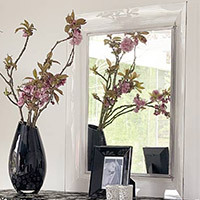 For last-minute touch-ups before rushing out the door, a mirror in the foyer is a decorating essential. Not only is it a practical place to practice your pout, a well-chosen mirror embellishes walls as well as a piece of art and brings a sense of openness to tight quarters. For similar wall decoration, you may also consider a modern clock hanging on the wall. 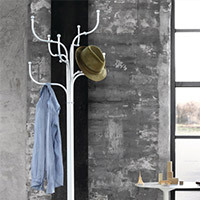 Finally, be sure to take a look at the variety of racks for your coat, hat, bag or other clothing items that will be ready to go whenever you are headed out the door. With the right selection of entryway lighting, home furnishings and other accents, you will be ready to properly welcome your guests. The Orion Chandelier by Maxim Lighting creates a lovely, soft contemporary style. 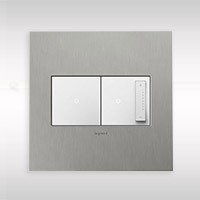 Orion features contoured framework in a fresh Satin Nickel finish. 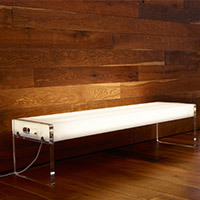 Ultra-chic snowy tones of Satin White inner glass and sheer fabric shades complete a plush design.